The slab or platform is the floor of the latrine. On this page, the words slab and platform will be used interchangeably. It is commonly made of concrete and covers the pit of the latrine. Platforms may also be made of wood or bamboo. The slab has a hole in it through with to defecate or urinate. Platform construction and design involves selecting the type of slab you want. This may be a squatting or a sitting slab. It will also involve deciding what, if any, improvements the pit latrine will have, calculating the dimensions of the slab, and determining the materials, labor, and tools needed to build it. It would be advantageous to develop drawings and plans for platform construction and any improvements along with a materials list. These items could then be given to the individual in charge of constructing the pit latrine. The type of slab designed will depend on whether the users prefer to sit or squat when using the pit latrine. Believe it or not, some people prefer one over the other. There are advantages and disadvantages to both. Basically, it will come down to the preference of the users. Sitting is the American way and most of us prefer the comfort and perceived civility of a nice toilet seat as opposed to an open hole over which you squat to do your business. Many people around the world prefer the squatting position. It is a natural position, after all this is how we pooped before we built toilets. It may also be viewed as being more sanitary, since there is no contact with a possibly dirty toilet seat. Whatever the user’s preference, you will want to decide what that is and plan accordingly for purposes of pit latrine platform construction. A squatting slab has some simple characteristic features that must be considered in concrete slab construction. It will have a hole, a pair of footrests, and a lid to cover the hole (see Figures 1 and 2). The hole is generally a key-hole shape, about 400mm (16 inches) long and 125 mm (5 inches)wide at the narrow end. The wide end is a circle that is 175mm (7 inches) in diameter. The back edge of the hole should be about 150mm (6 inches) from the back wall of the pit latrine which, depending on the design may be at the edge of the slab. If the distance is more, there is more of a chance of soiling the floor. The distance between the edge of the hole and the edge of the slab may be more if the pit latrine has a vent pipe. Placement of the footrests ensures that the user is correctly positioned over the hole, so their placement is important. They are oval in shape and about 300 mm (12 inches) long, 125 mm (5 inches) wide, and 25 mm (1 inch) high. The lid should cover the hole, but not fit inside it, and it should have a handle (see Figure 2). 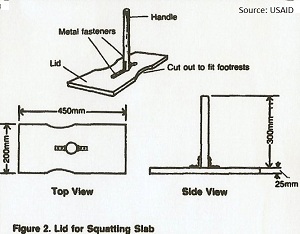 The main features of a sitting slab include a hole, a pedestal or riser, a seat, and a lid to cover the seat. 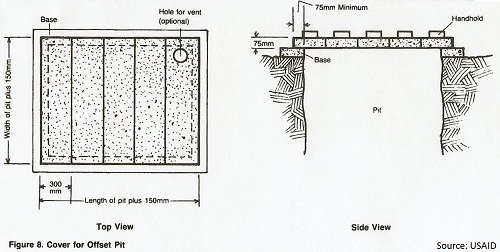 The hole is 250-300mm (10 inches-12 inches) in diameter and should be about 150mm (6 inches) from the back wall of the pit latrine which may be at the back edge of the slab (see Figure 3). The pedestal is 275-350mm (10 inches-14 inches) high and has the same diameter and the hole. The thickness of the pedestal walls depends on the materials used. The seat is attached to the top of the pedestal. Its outside measurements are equal or greater than the outside measurements of the pedestal. The seat has a hole in the center 200mm (8 inches) in diameter. A second seat with a smaller hole (150mm or 6 inches) can be included for children. The lid covers the seat and is often attached to the back of the seat with a hinge (see Figure 3). A simple pit latrine can be improved by the addition of some basic features. These include a vent pipe, a pour-flush bowl, an off-set pit latrine, or a combination of the three. Any improvements like this that you make to a simple pit latrine will change concrete slab construction for the latrine. If the pit latrine is going to have a vent pipe, the pit must be about 300mm (12 inches) longer than the pit for a simple pit latrine. The slab must, therefore, be about 300mm (12 inches) longer to cover the pit. 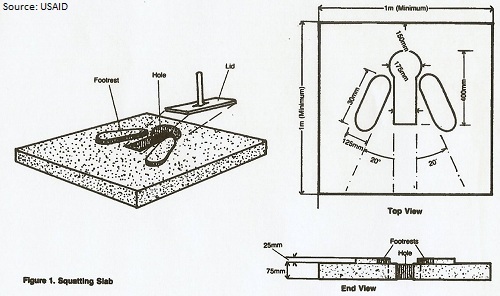 The distance from the back edge of the hole to the edge of the slab will be 300mm (12 inches)longer than the simple pit latrine slab (see Figure 4). 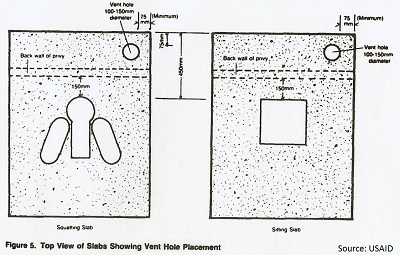 The slab has an additional hole (100-150mm or 4-6 inches in diameter) to accommodate the vent pipe (see Figure 5). The vent pipe can be made from sheet metal or tin and should be topped with fly-proof screen. If the pit latrine is going to have a pour-flush bowl, the shape of the squatting hole must conform to that of the bowl. These bowls are often pre-fabricated, so they will determine the shape and dimensions of the squatting hole. 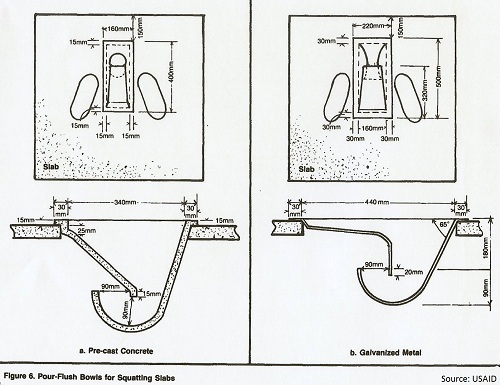 For purposes of concrete slab construction, the bowl should be positioned to flush forward to prevent erosion of the pit wall (see Figure 6). The slab of an off-set pit latrine rests on a platform made of wood, bricks, or concrete and has a metal chute attached to the hole. The chute can be made of a sheet of metal or tin. It enters the pit at a downward angle of 50 to 60 degrees. The upper end is mortared to the bottom of the slab and encircles the squatting hole. The lower end narrows to about 200mm (8 inches) in diameter and extends about 100mm (4 inches) beyond the pit wall (see Figure 7). The pit must have a cover which can be made in one piece or in sections for easier handling as shown in Figure 8. The cover must be strong enough to prevent persons from falling into the pit. 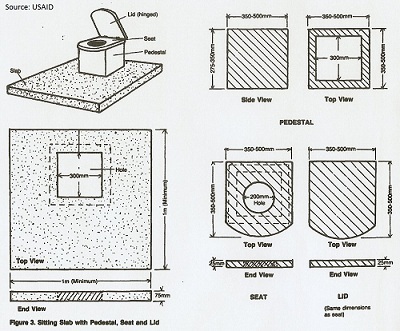 If there is a combination of improvements added to a simple pit latrine design, each improvement will modify the design of the slab as described above. For example, a latrine with a vent pipe and a pour-flush bowl will have a longer slab to accommodate the vent pipe and a specifically shaped hole to accommodate the pour-flush bowl. There is one exception. 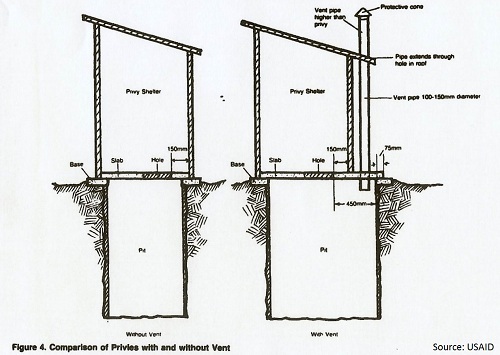 The slab design for an off-set pit latrine is the same whether or not the pit has a vent pipe. This is because the vent pipe in an off-set pit extends through the pit cover and not through the slab (see Figures 7 and 8). Slabs for unimproved, ventilated, and pour-flush latrines must cover the pit and overlap each edge by at least 75mm. Therefore, the length of a slab for one of these latrines equals the length of the pit plus at least 150mm. The same goes for the width. The width of the slab equals the width of the pit plus at least 150mm. The slab for an off-set pit latrine, since it is not covering the pit, can be about 1 meter square. The cover for the pit of an off-set pit latrine, like those of the unimproved and our-flush latrines, must also overlap each side of the underlying pit by at least 75mm. If the cover is made of reinforced concrete, it should be made in sections so it can be removed and replaced. Each section should be 150mm longer than the width of the pit, for an overlap of at least 75mm on each end. Each section can be about 300mm wide. You will make enough sections to cover the pit. The section of the cover at one end of the pit can be whatever dimension is needed to completely cover the pit with a 75mm overlap on that end. This piece of the cover will always be the end piece so it will always take up the space and it will always fit (see Figure 8). The thickness of the above slabs and the off-set pit cover will depend on the material it is made of. In the case of a reinforced concrete slab, it should be 50-75mm thick. A vent pipe is 2-2.5 meters long and 100-150mm in diameter. 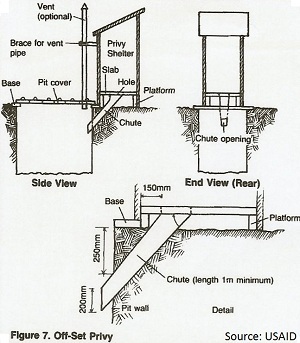 A chute for an off-set pit is at least 1 meter long with an average width of 200mm. Once the type of desired improvements to a latrine have been determined, prepare design drawings showing correct dimensions and top and side views of the slab and improvements. These drawings can be used by the person in charge of constructing the slab. Generally, latrine slabs are made from concrete because it is easily obtained in most places. Concrete is strong, long-lasting, and easy to clean. Latrine slabs may also be made of wood or bamboo. A common mix by volume for concrete components is 1:2:3. That is, 1 part cement, 2 parts sand, and 3 parts gravel plus about 2/3 part water or enough water to make a fairly stiff mix. The cement should be Portland cement. The sand should be clean and sized 6mm or less. The gravel should be clean and sized 6-25mm. The water should be clear. The concrete slab must have reinforcing materials such as re-bar, wire mesh, or split bamboo. 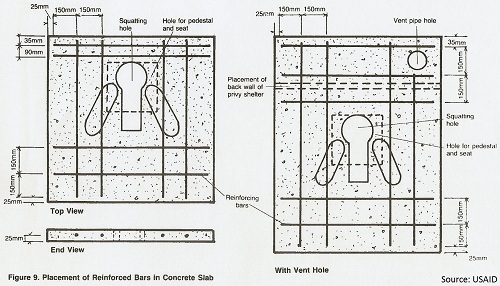 Reinforcing material must not block the hole in the slab and no part of it should stick out through the concrete (see Figure 9). For details on calculating quantities for concrete mix and on working with concrete, see “Basics of Mixing Concrete”. If the latrine slab has a seat and pedestal, the pedestal can be made from brick, concrete blocks, or wood. The seat can also be made from wood. One piece seat and pedestal units may be available. A cover made from wood should be provided for both squatting and sitting-type slabs. The cover for the seat and pedestal can be attached to the seat with a hinge. A pour-flush bowl may be made of galvanized metal, concrete, molded rubber, or ceramic material. These units may be purchased pre-fabricated and ready to install. A skilled craftsman could reproduce a galvanized metal or concrete pour-flush bowl using the design information in the Figure 6. A metal bowl must have rounded edges. A concrete bowl must be cured in water for at least one week. Pour-flush bowls can be secured to the slab with concrete mortar. A vent pipe and a chute can be made of galvanized metal or tin by a semi-skilled workman using tin snips, pliers, metal screws, and a screwdriver (or other means of securing the metal), and black paint and a paint brush. A section of bamboo can also be used as a vent pipe. The cover for an off-set pit can be made of wood, metal, or reinforced concrete by a workman familiar with these materials. When the materials needed for the latrine slab construction have been determined, you can prepare a materials list showing types and quantities of all materials, tools, and labor needed to construct the slab and improvements, and the estimated costs of all of these things. This list can be given, along with the design drawings, to the person in charge of constructing the slab. Return to "Introduction to Sanitation Facilities, Part 2" from "Pit Latrine"